December 2, 1980. The segment from and including all of the Tangle Lakes to a point 1/2-mile north of Black Rapids. Wild — 20.0 miles; Scenic — 24.0 miles; Recreational — 18.0 miles; Total — 62.0 miles. The Delta River watershed extends from the Upper Tangle Lakes downstream to Black Rapids; the Tangle River flows through and connects the lakes (150,000 acres, 160 miles of streams, and 21 lakes) before finding its way to the Delta River. The Delta then flows north to join the Tanana River and, eventually, the Yukon River. The topography in the vicinity of the lower Delta River region is dominated by the rugged peaks of the Alaska Range, ranging in elevation from 6,000-9,000 feet. Glaciers occupy some of the slopes of these peaks. The land adjacent to the lower Delta River includes steep alluvial slopes, rock cliffs and spectacular geologic features. The southern stretches of the designated corridor are located within the Tangle Lakes Archaeological District and contain nearly 280 recorded archaeological sites. Almost all of the earliest known archaeological sites in the region are found within the designated river corridor, representing a history of humans hunting, mining and subsisting from more than 10,000 years ago through the recent past. Few rivers anywhere in the world can match the quality and quantity of the Arctic grayling fishery. High-quality lake trout fishing is available in late winter and early spring, as well. Tangle Lakes and the Delta River also support round whitefish, lake trout, burbot and longnose suckers. 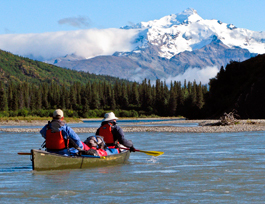 This is one of a few easily accessible wild and scenic rivers in the state of Alaska, providing both day use and overnight backcountry excursions. A wide range of outstanding recreational opportunities attract people of all ages and abilities for river-related solitude and the undisturbed environment, or for activities such as wildlife viewing, fishing, hunting, trapping, camping, hiking, snowmachining, skiing and photography. Boating opportunities include both lake and river paddling on clear and glacial water stretches, challenging whitewater and exceptional opportunities. The corridor is flanked by both the low, rolling tundra hills of the Amphitheatre Mountains and the high, rugged, snow-covered peaks and ridges of the Alaska Range, offering high-quality scenic vistas. The river and surrounding hills provide undisturbed views of the river canyon, waterfalls, channelized riverbeds, tributaries, granite rock outcroppings and glacial alluvial processes. More than 100 species of migrating birds and waterfowl use the river corridor and the surrounding lakes as nesting areas. The trumpeter swan, a BLM sensitive species, is found in the wetlands of the Upper Tangle Lakes, and bald eagles frequent the area. Grizzly bears frequent the lowlands to fish and hunt where moose spend the summer and drop their calves. Tens of thousands of Nelchina caribou travel through this area during their annual migration to and from the calving grounds.